PESHAWAR: The Revolutionary Association of the Women of Afghanistan (RAWA) on Tuesday distributed medicines among the poor and needy Afghan refugees at the Jallozai camp. The RAWA team comprised of female doctors and activists of the Association including Saima Karim to help their countrymen in their hour of trial. A number of UN officials also visited the camp to take stock of the situation. About 400 individuals were provided with medicines and the doctors also checked a number of patients. "We are poor people and our organization cannot afford to provide all the refugees with health facilities. It is the duty of the international community and UN to come to their help", said Saima Karim. 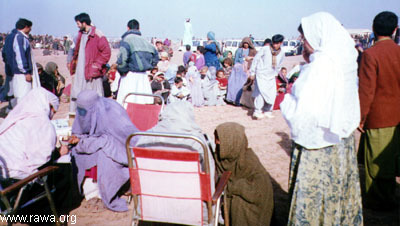 Another mob of helpless women and children thronged to a medical camp established by the Revolutionary Association of the Women of Afghanistan (RAWA) at a distance outside the plastic made tents. The women belonging to different age group, majority of them were old, carrying minor children in their hands, wrapped in old, dirty and shady warm cloths, had encircled one male and two female doctors of RAWA and two officials distributing medicines after their check ups. Majority of the old, who could not afford pushing and moving towards the doctors' team, were sitting disappointed watching the situation. ISLAMABAD- Revolutionary Association of the Women of Afghanistan (RAWA) on Monday aired a distress call for help of Afghan refugees who have freshly arrived in Peshawar. Officials from the United Nations and other humanitarian organizations have said the conditions of the fresh arrivals are deplorable. Forced to live in open even by night in freezing cold, they are in urgent need of blankets, beddings, and warm clothing. The most vulnerable are children and the aged. Already, several children at the camp have died of cold, disease and malnutrition. Faced with utter lack of food, some of these new DPs are said to have been compelled to eat grass and weeds out of hunger. "We are witnessing but can do nothing tangible", said RAWA's distress call. "If you get somebody or some interested NGOs/ institutions to help in an URGENT way, please DO it without delay. Even a few thousands of quilts/blankets along with a small amount of money would be OK for the time being". RAWA have planned to distribute quilts/blankets among the refugees at Jallozi camp. "A blanket in Pakistani markets costs around US$4. Your URGENT donations can save life of many ill-fated children. Kindly send your donations in cash or a check payable to "Support Afghan Women" to the following address and inform us through email. PESHAWAR- Two mobile health care team of the Revolutionary Association of the Women of Afghanistan (RAWA) visited Akora Khattak refugee camp, checked the ill children, women and distributed medicines among them. The team comprising of two lady doctors and RAWA activists are visiting different camps where newly arrived refugees are living in tragic condition. The helpless refugees rushed to the medical camps. According to a RAWA press release, they examined more than 500 patients and distributed medicine among them. The RAWA representatives said that the cold weather and lack of clean drinking water have badly affected these refugees particularly the children. She said, “the actual need of medical care in the camp is for more than what RAWA can provide for ill-fated people. But due to our own critical financial situation we can’t help them in a tangible way. We have appealed to our supporters throughout the world but the donation so far we have received is nothing. PESHAWAR: Two mobile healthcare teams of the Revolutionary Association of the Women of Afghanistan (RAWA) visited Akora Refugees Camp and checked ill children and women and distributed medicines among them on Tuesday. The teams comprised of two lady doctors and some of RAWA activists are visiting different camps where new arrived refugees are living in tragic situation. Hundreds of women rushed to the medical camp and the teams checked more than 500 patients and distributed medicines among them. Due to cold weather and lack of clean drinking water many refugees especially children are suffering from different diseases Already several children at the camp have died of cold, disease and malnutrition. The actual need of medical care in the camps is for more than what RAWA can provide for these ill-fated people. But due to our own critical financial situation we can't help them in a tangible way RAWA has already appealed for help from our supporters around the world but the donation so far we have received nothing comparing the need of new refugees According to the refugees living in the Akora camp, no other NGO or UN related organizations have helped them so far. Un fortunately, though the world community is aware of the recent disastrous situation of Afghan displaced people on the border areas of Pakistan, Iran and Tajikistan, but they do not pay any attention to it. They just turn back to this tragedy. The criminal Taliban and their criminal Jehadi opponents are the worst inhuman creatures who by their infighting are the main reason for the displacement of people besides drought. Some refugee women talking to RAWA activists said that they prefer to be killed inside Afghanistan than to live in such horrible situation and witness the gradual death of their children. RAWA in its turn will help the ruined refugees and will provide any facility that is in our hand. RAWA also plans to distribute blankets and cloths among the refugees in few days. PESHAWAR: Two mobile healthcare teams of the Revolutionary Association of the Women of Afghanistan (RAWA) visited Akora Refugees Camp and checked more than 500 patients and distributed medicines among them, said a press release here Wednesday. The teams comprised two lady doctors and some of RAWA activists. The team came to know that due to cold weather and lack of clean drinking water many refugees, especially children, were suffering from different diseases. Already several children have died of cold, diseases and malnutrition at the camp. Quoting refugees living in the Camp, RAWA claimed that no other NGO or UN related organizations have extended them any help so far. RAWA resented that though the world community was aware of the recent disastrous situation of the displaced Afghans, in the border areas of Pakistan, Iran and Tajikistan, it did nothing to mitigate their sufferings. Some refugee women, RAWA said, were living in such a miserable condition at the camp that they would prefer to be killed inside Afghanistan than living in such horrible conditions and witnessing the gradual death of their children.